Hello ULC Ministers, welcome to the ULC Monastery's Newsletter for the month of December. We all know what December means, it's time again to gather your friends and family and celebrate the holidays! 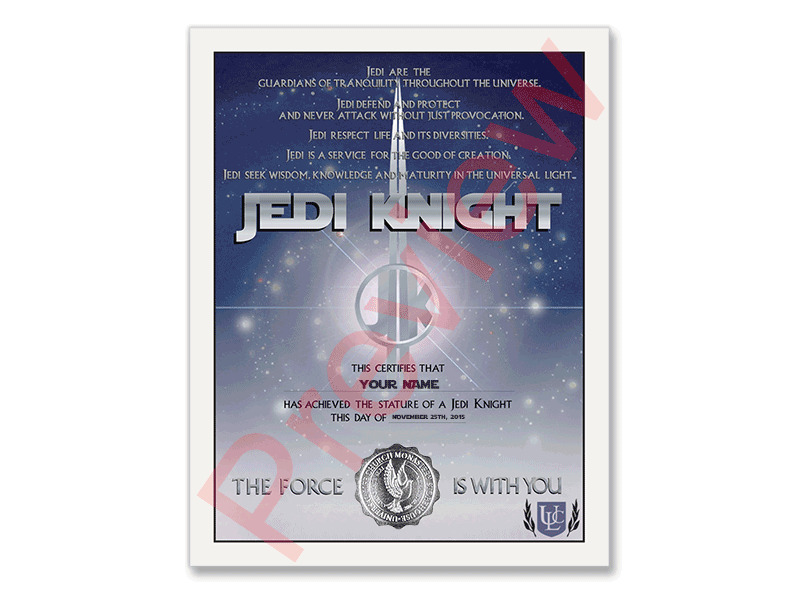 If you're still tracking down the perfect item for the Star Wars enthusiast in your family then be sure to check out December's featured item, the Jedi Knight Certificate. We've also filled this month's newsletter with word of the ULC Monastery's recent contributions to a local Homeless shelter. Be sure to read the recent blog entries discussing current Religious Extremism in the US as well as how comedian and ULC Minister, Russell Brand, is using his comedy to perform marriages all across the country. No matter your personal beliefs, we hope you enjoy this month's newsletter and would love to hear all the ways our ministers will be spending their own holidays! Let us hear your feedback by joining us on our blog, Twitter, and our Facebook page. In the spirit of the holiday season, we here at the Universal Life Church Monastery want to share with our ordained ministers an update on our charitable gifts. We recently had the privilege of receiving a letter from the St. John the Almsgiver Society, announcing that our donation would be put to good use at the St. Martin de Porres shelter in Seattle. Much needed food and supplies for hundreds will be purchased to reach out to the needy and elderly to whom this great organization helps support. This is just one such institution that needs our help, and we must answer the call. As an ordained minister of the church, your support is appreciated as well, whether you donate by extension through the Monastery, or directly to a worthy cause. For a list of charities and organizations to which the ULC Monastery regularly donates, you may view our list. What's the Best Answer to Evangelical Extremism?